Caramella was founded in 2010. 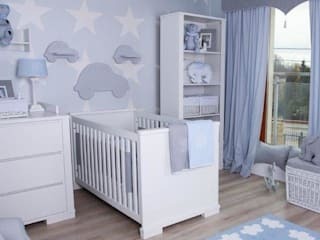 We are the producer of furniture and accessories designed for baby's and older child's interiors. All Caramella's products are made by us- from the idea, through the design, to the production. What makes us so special? We offer ready-to-apply sollutions for completed and stylish furnishing a child's interior. Each of our products is designed to be a part of a compact collection and, at the same time, to function as an individual element in already existing interior. The highest quality, original patterns, special care of details and handmade production are main features of every Caramella's product. Please visit our website (http://www.en.caramella.pl) or our stores located at Wiertnicza 127, Wilanów and Radna 2/4, Powiśle, Warsaw. In the 200 m2 store located in Powiśle you can find all Caramella's products (products for infants, babies and older children), STOKKE baby carriages and accessories, Bugaboo baby carriages and carefully selected accessories of the best European producers. In our second store, in Wilanów, you can find selected Caramella's assortment. In our stores, you can buy accessories from every Caramella's collection, order furniture, wallpapers and window decorations.